Regarded today as one of the most influential bands in rock music, The Velvet Underground made their first impressions in Greenwich Village, where they would eventually be taken into Andy Warhol’s sphere of influence and creativity. The band first found itself encountering Andy Warhol at Café Bizarre. The band and Andy Warhol created The Dom as a nightclub to showcase their artistic work. Greenwich Village itself provided the band and Warhol as a venue to perform. The Velvet Underground & Nico with Andy Warhol. Lou Reed and John Cale founded The Velvet Underground (initially called “The Velvets”) during the 1960s in New York City. First, Reed and Cale needed to have set band members. Sterling Morrison and Maureen Tucker became guitarist and drummer. The band began performing songs that reflected both cultural aspects of life in New York City as well as the visible beat movement happening in Greenwich Village with artists like Bob Dylan. Eventually, the band’s then-manager Al Aronowitz got them a spot as the house band of Café Bizarre, which was located at 106 West 3rd Street. Rick Allmen owned and ran Café Bizarre as a place where the beatniks could come together. Avant-garde artists in different disciplines, such as music, poetry, and film, also began to go there. The club’s themes and patrons fit well with what The Velvets set out to accomplish in their music at the time. It was on the way to one of their sets at Café Bizarre when Reed wrote the song “Run, Run, Run” on the back of an envelope. One night while playing at Café Bizarre, The Velvet Underground (still playing as “The Velvets”) first gained connections with Andy Warhol. Paul Morrissey, a film director who frequently worked with Warhol and managed Warhol’s Factory, saw the band perform on New Year’s Eve and decided they were right to become the house band for Warhol’s new club. The next night Warhol also came to Café Bizarre to see The Velvets. Eventually, the band was not pleased with their residency at Café Bizarre. They played the song “The Black Angel’s Death Song,” which they knew would result in the band being fired. Café Bizarre unfortunately closed, but its memory still remains important for music in Greenwich Village and The Velvet Underground. Paul Morrissey, Andy Warhol, and Lou Reed. 1966. Taken by Nat Finkelstein. Andy Warhol and Paul Morrissey became The Velvet Underground’s managers in 1965. The Dom became the new club in Greenwich Village where they became house band under Warhol’s creative influence. Located on St. Marks Place, The Dom was originally part of the Polish National Home. As the bohemians and beatniks began to takeover the area of the East Village, the building became a restaurant before Warhol and Morrissey turned it into a nightclub. During The Velvet Underground’s time at The Dom, Warhol created a show of film and lights to surround their performances. Named the “Exploding Plastic Inevitable,” Warhol and The Velvet Underground created a psychedelic experience to showcase in Greenwich Village. The band and their managers did not actually own The Dom during this time and performed in it as a sublet. Before getting a permanent contract on The Dom, they decided to go tour Los Angeles and came back to find that Bob Dylan’s manager took the club’s lease. After going through different names (“The Balloon Farm” and “Electric Circus”), The Dom closed in 1970. 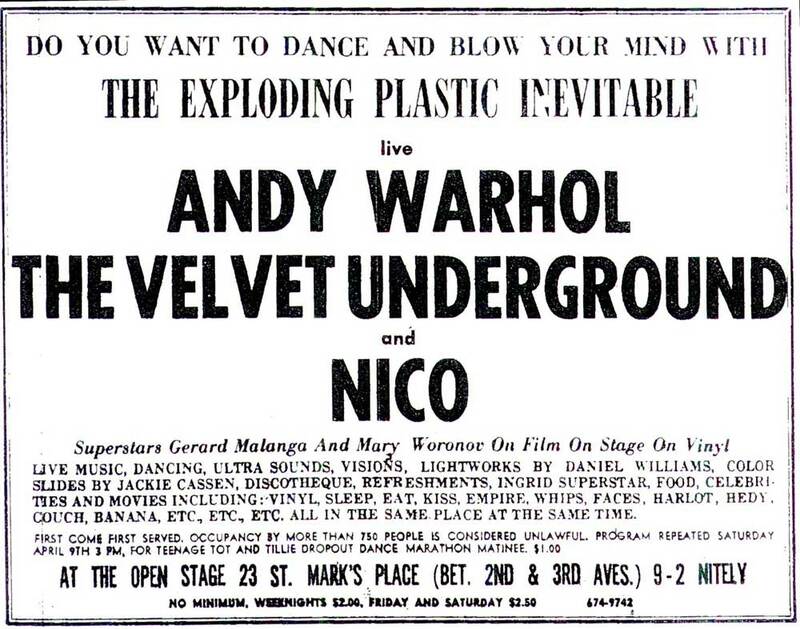 Advertisement for an Exploding Plastic Inevitable show at The Dom. Only a portion of the full story of The Velvet Underground took place in Greenwich Village. The Velvet Underground and Andy Warhol along with the clubs they performed in only spent brief times in Greenwich Village, but they still contributed significantly to the overall arts and culture of the area in the 1960s. Harvard, Joe. The Velvet Underground & Nico (33 1/3). New York: Continuum, 2010. Comenas, Gary. “Café Bizarre.” Warholstars. 2014. 28 Sept 2014. This post offers a really interesting look into the origins of the team behind the famous pop art banana. I had always assumed that the velvet underground commissioned Warhol for their album cover and their relationship grew from there. Very interesting to note how important greenwich village music venues are in forming this relationship.